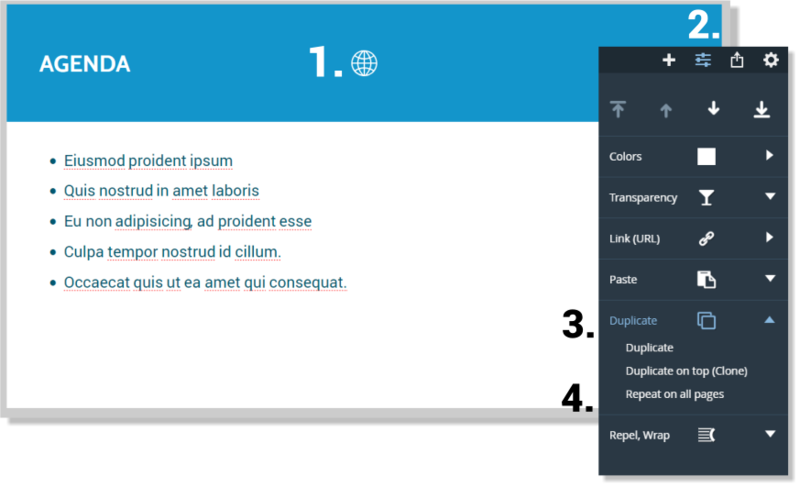 There are elements that are common to all pages in a document - like navigation buttons, headers, footers or logos which can repeat on all pages. When you update one of these repeating items, Xara Cloud automatically replicates those updates across all pages. You can make any object a repeating object by selecting it and then in the Properties menu tapping Duplicate > Repeat on all pages. The object is copied to the same place on all pages. If you make any further changes to the item all the copies will be automatically updated. Select the item you want to repeat. Tap the Properties button . Then Repeat on all pages. Select the item you want to stop repeating. 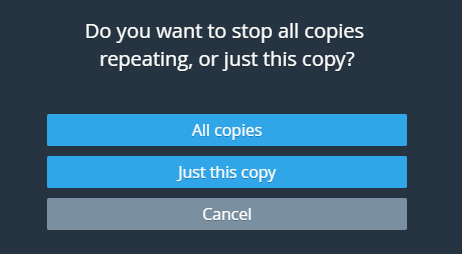 You'll see a notification asking you whether you want all copies of the item to stop repeating or just the selected instance. You can have repeating objects which are groups - so you might have a logo grouped with some text for example. You can also use anchored and embedded objects inside repeating objects. This means for example that anchored comments can be used with repeating objects and repeating headers can contain embedded graphics.